As a professional artist (“professional” meaning you get paid to do your work — i.e. commissions — whether it be part-time or full-time work), I recommend creating and maintaining a Facebook business/professional page (or Fan Page). Whether you have a personal website or not. Do it. Facebook isn’t perfect but Facebook pages are a great home-base for attracting new followers, sharing information and engaging content, organizing events, doing social media magic like live streaming, and managing messages. Ever notice how a business page has a different vibe to it than checking out your friend’s personal page? Would you talk to a business out of the blue the same way you would chat with your life-long BFF? Probably not. Having a professional page makes you look like the professional you are by making it all about your content! It’s also great for evaluating your content through actual statistics! Monitor the activity from your supporters (comments, likes, clicking buttons, sharing posts, etc.) and evaluate what gets more attention so you can keep your followers happy! By streamlining your page to give people important business information, keeping things positive and upbeat, while skipping all the personal drama and distracting videos and annoying memes that people share to your personal page, it makes it easy to show that your art or service is the star. Visitors are able to share posts to your page or ask questions publicly but they are kept separate and can be managed. You can even restrict comments and content from outsiders to the point where they can’t even reply to your post with images. When your page is clean, organized, and down to business, you have a better chance of being treated respectfully as well. I mean, who wants catcalls through Facebook when you’re eagerly awaiting the next commission order to come through? I’m not just some pretty face on Facebook, I’m a bona-fide business person now. Sorry fellas! This girl’s just trying to make a buck… and she’s taken! I do have long-time friends that are supporters and supporters who have become so close over the commission process that they are friends! It’s always so awesome when that happens but it does take time and a lot of chatting before that kind of friendship develops! SO WHAT CHA WAITING FOR? Info on how to make your Facebook page can be found at Facebook’s Help Center. When I was just getting started with my Facebook page, I spent a few hours “nesting”, doing my best to make my page more homey and inviting. I spent time making a banner and icon that communicates my brand/aesthetic, creating a bio, and establishing other important information such as links to galleries, uploading examples of my work, establishing prices, etc. No need to worry about getting everything perfect for the launch of your shiny new page. I constantly picked and poked at my page to improve the flow and appearance ever since I created it and I’m sure you will do the same. For instance, my Learn More button at the top of the page leads people to my website, which is a new addition as of 2016. Facebook is a social network like an ocean of fish and your page works as a gateway to get those fish to check out your special pond whether it’s your shop, website, etc. This is exactly the reason why despite having a website, you need to direct people to that website. Facebook, Instagram, Twitter, and other social media platforms have those people and make it possible to reach them. But until you have that website set up, you can customize your Facebook page to suit your needs. Establish a shop front if you want to use Storenvy, add an introductory video, and more! Once you get that page rollin’, it is the perfect time to start inviting your friends and fellow artists to support your new page! Invite everyone you’re friends with on your personal page or just the people you think will have an interest in your work. Facebook makes it easy to cherry pick your followers so you don’t risk spamming every person you’ve ever known. I love my Facebook page for sharing content from sites like YouTube, Instagram, Patreon and my website. I can also stream live to my Page via my phone or even stream live from my desktop as I work on digital work. 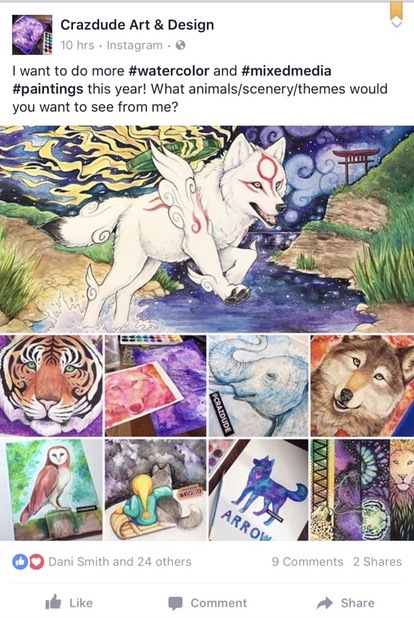 What’s great about this social network is that I don’t have to be restricted to just sharing content on my page (where I can see it and the people who are already following my art can see it) but once it’s on my page, I can share it out to different Facebook groups that I have become a member of (via my personal page.) Groups with subjects like pet portraits, traditional art, furry art, furry commissions, and animal art are relevant to me and I can easily share my work with hundreds of people that may hopefully become supporters. Figure it this way: there are people with FB accounts that are shopping around these FB groups for artists to commission, why not tap into that market? And what better way to do that than directing them to your Facebook page where they can follow you and possibly commission you later? Makes sense! Thanks, Facebook! And after a while (or with the help of running your own raffle), your followers and friends may do you the favor of sharing your posts off to their friends. Thanks, friends! There is the option to pay for advertising but I have heard mostly poor reviews on advertising bang for your buck. If you have a little time to post a copy-paste response to commission inquiries in different Facebook groups and occasionally share new work to groups as you go, you will build a great following that way. Remember also that even though someone posts in a sale group to inquire about commission examples and prices but their budget is less than what you usually work for, you can always comment with your info just in case either 1.) that person posting saves up a little more money to throw your way or 2.) a fellow commenting artist sees your examples and falls in love with your work. As you create new posts, you will be able to pin an important or relevant entry to the top of your page so people will see it when they come to your page. I will often pin a recent commission I’m proud of or an upcoming event or announcement. You can click the arrow on the right-hand side of the post and select “Pin to Top” from the drop down menu. On your newly pinned post, you will see an orange ribbon or bookmark in the same right-hand corner, which notes that it has been pinned. like art shows and conventions), I will create an event on my Facebook Page with the dates, times, and official website. Instead of publishing right away (likely many months in advance) and leaving a lot of info “To Be Announced”, I can leave it as a draft (note: creating drafts is not currently an option on mobile device) — this way I can see all of my potential events in chronological order but only publish (and announce publicly) once I have applied to these events and have been officially accepted. Confirmed events are listed publicly, TBA events are marked as drafts and only visible to me. It helps with planning and prioritizing events so that I can budget wisely and don’t double-book! In terms of communication, Facebook page messaging interface makes it easy to keep track of messages from different people across Facebook. You can label messages and add notes for your eyes only regarding the messages. For instance you can make a label to determine the difference between someone inquiring about commission prices and other kinds of correspondence (like advice) so that commission inquiries don’t get lost in the shuffle. I also make detailed notes of whether a person had commissioned me before, if they live outside of the country (for shipping rates), or any other important notes to help with communicating and serving the customer better. Also in my messages, if I see someone inquired about prices but never got back to me, I will send them a kind greeting, tell them that commissions have reopened with new options, inform them on where to find the new prices, and wish them a happy week. It’s the professional thing to do. And heck, you already know they have an interest in your work, it won’t hurt to message them briefly to keep them informed. Want to bring an idea to life or adjust your page to your particular preferences? Search Facebook’s Help Center, Google, and Youtube for other ideas and detailed tutorials. I hope that you found this to be informative! Outstanding, inspiring post, Carrie! You’re such a good writer. Your post inspired me to create a Facebook page that I’ve had for a few months now. My problem now is that I am very bad at keeping up with posting because I keep thinking that I need to upload my older work that’s on my DA/FA before I can upload my new work, and then I never get to doing either! I’ve had DA/FA much longer than FB, so I feel that I have 30+ pieces to upload so that my fb page can “catch up” before I start posting newer work. I have this problem on any new art site that I start on! Do you have any advice?? 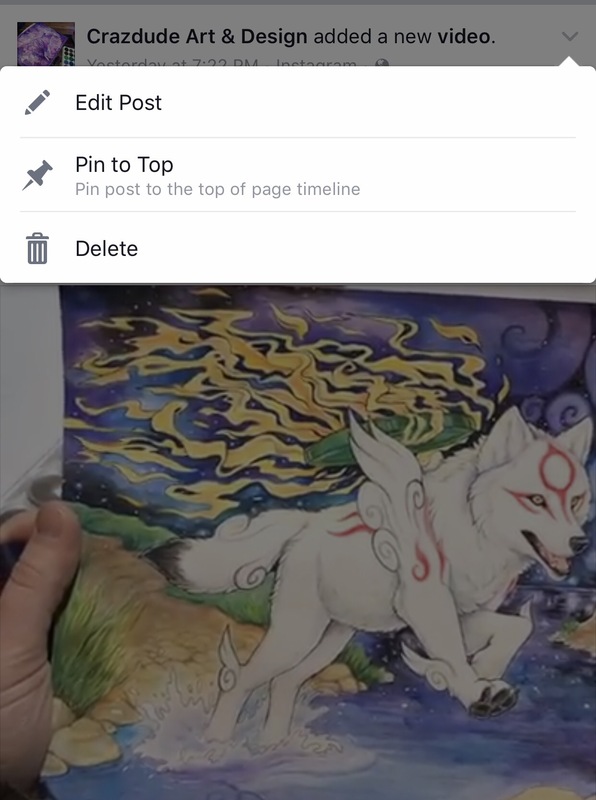 I think the best way to do it is share a link to your existing gallery every so often — especially if you plan to keep your DA/FA while you manage your FB. That way you can share your older work without feeling obligated to post every single thing in order. Also, use special hashtags to your advantage! If you want to showcase something that you were proud of back on your old page, post it on Thursday as a “throwback Thursday” (hashtag is usually ‘tbt’) so that you can post older art without it feeling sorely out of place.